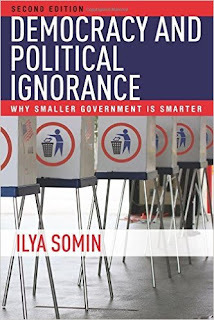 I recently spoke with Ilya Somin about his book, Democracy and Political Ignorance: Why Smaller Government Is Smarter, which he has revised for a second edition. The book argues that widespread ignorance about public affairs creates serious obstacles for democracy that can best be handled by decentralizing and limiting government. This is part one of a two-part interview. Part Two will appear tomorrow. JB: Why did you decide to do a second edition of your book? IS: It is rare for an academic book to get a second edition, and rarer still for it to happen just three years after the first edition. But I thought a second edition was justified for several reasons. First, I wanted to address several important issues that were not included in the first edition. A particularly important one is the argument that foot voting is dangerous because it will exacerbate the supposed trend towards ideological segregation famously dubbed “the Big Sort” in the book of the same title by Bill Bishop. Another is the claim (increasingly popular in academic circles) that we can overcome political ignorance by using jury-like bodies selected through “sortition” to make political decisions. The new edition also addresses the relationship between political ignorance and the disproportionate political power of the wealthy – an increasing focus of controversy in both public and academic debate. Another factor in my decision was the widespread interest in the subject of public ignorance that has arisen in the United States and indeed around the world over the last few years. To my surprise, the book was mentioned and discussed media as far afield as Indonesia and the Philippines. Democracy and Political Ignorance has even been translated into Italian and Japanese. That’s far less a reflection on me than an indication of the significance of the book’s subject. There is growing recognition that public ignorance is a major challenge for modern democracy, and that it is not limited to any one nation, to the supporters of one party, or to one discrete set of political issues. I addressed my reasons for writing a second edition in greater detail here. JB: Could you explain what is distinctive about political ignorance as opposed to other kinds of ignorance? What are some of the consequences of that distinction? How, if at all, is political ignorance related to people's knowledge of other subjects closer to their lives? IS: In some ways, political ignorance is just like any other kind of ignorance. None of us can learn more than a tiny fraction of the information out there. We must inevitably pick and choose. We are, in that, sense all rationally ignorant about the vast majority of subjects. The difference between political ignorance and most other types of ignorance is the way in which rational ignorance by individuals leads to bad collective outcomes. Because there is so little chance that any one vote will affect the result of an election, it makes sense for any given voter to devote little or no time to studying political issues. The chance that his or her ignorance will make a difference is infinitesimally small. But when an entire electorate (or a large part of it) acts that way, we end up with a largely ignorant public, and a political system where public policy is heavily influenced by that ignorance. In addition to doing a poor job of acquiring information, most voters also do a poor job of evaluating the limited information they do learn. Instead of acting as objective truth-seekers, they routinely act as “political fans” – overvaluing anything that reinforces their preexisting views and downplaying or ignoring anything that cuts the other way. It’s not just that public ignorance might help the “wrong” side win an election. It’s that all the major-party options before us are worse than they might otherwise be, because politicians know that they must cater to a largely ignorant electorate in order to win. Political ignorance is similar to pollution. Individuals have little incentive to refrain from polluting, because emissions from any one car make only an infinitesimal difference; the collective impact of gas-guzzlers, however, can inflict great harm on the environment. In the same way, widespread public ignorance pollutes our political environment, even though the ignorance of any one voter matters very little. JB: How does political ignorance affect our standard conceptions of democracy? IS: In Chapter 2 of the book, I go through several widely accepted normative theories of democratic political participation. As I explain, all of them have implicit knowledge prerequisites that voters need to meet in order for the system to function in the way the theory suggests. Sadly, the actual knowledge levels of voters fall well short of the requirements of even the less-demanding theories. It is not a great surprise that voters don’t do well by the standards of, say, deliberative democracy – a theory that asks a great deal of citizens. But it’s notable that they also fall short of the prerequisites of what most people think of as relatively undemanding alternatives, such as “retrospective voting,” a theory that says voters need only have enough knowledge to punish incumbents at the ballot box if their performance in office is poor. It turns out that ignorance often leads us to reward and punish incumbents for things they did not cause (such as short-term economic trends, droughts, and even victories by local sports teams), while letting them off the hook for some issues that they have more control of. JB: What are the most important public policy consequences of the current degree of political ignorance in the United States? IS: Survey data suggests that more knowledgeable voters have systematically different views from more ignorant ones, even after controlling for a wide range of other characteristics (race, gender, income, occupation, partisan affiliation, etc.). On most issues, they are more economically conservative and more socially liberal – though I hasten to add that does not mean most are anywhere near as libertarian as I am. It is also worth noting that decades of survey data indicates that more knowledgeable voters are less xenophobic and more tolerant of racial, ethnic, and religious minorities, and of gays and lesbians. Overall, the forces that benefit most from political ignorance are right-wing nationalists who combine xenophobia with support for a large welfare and regulatory state: people like Donald Trump in the US, the National Front in France, and others. However, conventional right- and left-wing parties also often effectively exploit political ignorance, in various ways. Aside from these more general effects, political ignorance also inflicts harm in a wide range of policy areas where it prevents the public from even noticing harmful or counterproductive government policies, or their effects. To take just one example within my areas of expertise, policy experts across the political spectrum agree that restrictive zoning is a major obstacle to affordable housing and job opportunities for the poor and lower-middle class. Yet the vast majority of voters (including those who suffer the most from this) are likely unaware of the connection between the two. As a result, there is little effective opposition to the entrenched interest groups that benefit from the status quo. There is a lot of low-hanging fruit like this in public policy, which political ignorance makes it hard for us to pick. In fairness, I should note that there are rare cases where political ignorance actually has beneficial effects; I discuss some in Chapter 2. But such situations are very much the exception rather than the rule.